Our Indiana Teen Driver Safety Program (DSP) is specifically tailored to teen drivers (under the age of 20). 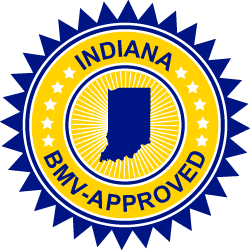 Like the Basic Driver Safety Program, it is fully approved by the Indiana Bureau of Motor Vehicles (BMV) to meet your course requirements and is 4 hours in length. If you're taking a DSP course to fulfill a court order, please check with your court to ensure that you are allowed to take the Teen Driver course. Your court may order you to take a specific course. Are you a teenager who is looking to take an Indiana BMV-approved Driver Safety Program course? Then you've come to the right place. Our Teen Driver Safety Program is tailored specifically for teen drivers (under age 20). Whether you're taking the course voluntarily to get a 4-point credit on your driving record or you're taking a DSP course to satisfy a BMV requirement or a court order, our Teen Driver Safety Program course will meet your needs. Our course consists of 11 lessons that include written material and videos. The course is 4 hours in length and includes timers to ensure that you meet the state-mandated time requirement for the course. However, you can complete it at your own pace: a little at a time or all in one sitting. Each time you log in, we automatically take you to where you last left off. Why should I complete the Teen Driver Safety Program? The Teen Driver Safety Program is specifically designed for teen drivers (drivers under the age of 20). The curriculum is tailored to a teen audience and will be the most beneficial for young drivers. Please check with your court to ensure that you are allowed to take the Teen course. Your court may order you to take a specific course. The Teen DSP consists of 11 lessons and quizzes. The course is 4 hours long and includes timers to ensure that you meet the state-mandated time requirement for the course. However, you can complete the course at your own pace: a little at a time or all in one sitting. Each time you log in, we automatically take you to where you last left off. After successfully completing the Teen Driver Safety Program, you will be awarded a Certificate of Completion. You will have the option to print a copy for your records. We notify the BMV within 24 hours if you complete the course Monday through Thursday. We notify the BMV the next business day (usually Monday) if you complete the course Friday through Sunday.